Fluid Rx Diagnostics by Magna-Guard has reached a strategic distribution alliance with National Pronto Association to distribute a co-branded “Instant Lubricant Diagnostics” fluid analysis kit and support program. Pronto will offer an exclusive 10-spot Vital Fluid Analysis kit to more than 75,000 installers and service facilities in the United States, Canada, Mexico and Puerto Rico, including special programs for its Pronto Auto Service Center members. All modern lubricants contain additives that inhibit breakdown. When these additives become depleted, the fluid degrades and can no longer perform its intended function. 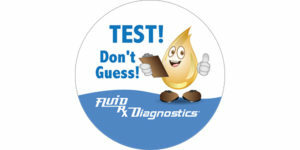 Fluid Rx Diagnostics measures additive depletion and the level of sludge or debris in fluids or oil. Fluid Rx Instant Lubricant Diagnostics follows all Motorist Assurance Program (MAP) Standards and California BAR guidelines when making fluid service recommendations. The test results show the actual condition of a vehicle’s vital fluids, including crankcase oil, brake, power steering, transmission, differential and transfer case fluids.